As my hair is bleached and super long, I really struggle with tangles but since The Wet Brush came into my life, tangles are a thing of the past. I use this every time I wash my hair and it just makes the job of detangling a lot easier! Apparently this is down to the 'Interlliflex' bristles of the brush and whilst I'm not too sure what they are, I'm going to roll with it. Monday to Friday I'm pretty lazy with my makeup and the only time I do it 'properly' is when I'm going out for the evening. I'm just one of those people who would rather have an extra ten minutes in bed! With this being said, any products that are super easy to use are very welcomed in my makeup bag. The Benefit High Brow is one of those products as it brightens up my eyes in a matter of minutes without the need for brushes. I simple dab it onto my brow bone and in the inner corners of my eye to make myself look that bit more awake. It's a gorgeous shimmery champagne shade and I tend to just wear this on its own without any other eyeshadow. It's fabulous! I'm pretty sure I've mentioned this on my blog multiple times now but it's for good reason as it's so bloomin good. 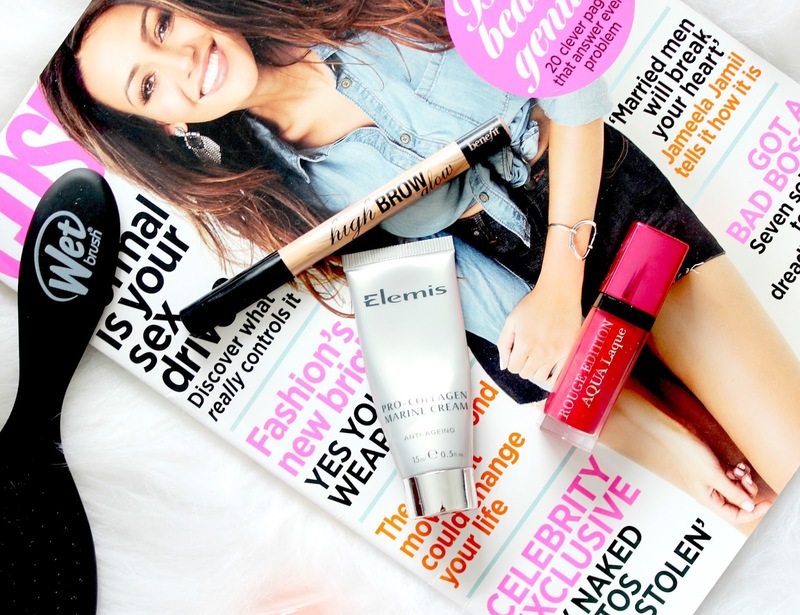 Elemis is my favourite skincare brand and their Pro Collagen Marine Cream is one of my favourite products of theirs - it has a super lightweight gel like consistency but hydrates my skin amazingly well. If I apply this before bed I can be rest assured that I'll wake up with soft, plump and glowing skin - it's a bit of a miracle worker really. This is an expensive product and probably not one for anyone younger than 20 but if you're 20+ and want to invest in a moisturiser that really does the job - it's 100% worth the splurge. Elemis recently sent me one of their limited edition jars of this and I cannot wait to dive into it when my little sample tubes runs out! I recently reviewed the new Bourjois Aqua Lacque lipsticks on my blog here and I've been really enjoying using the shade 'Fuchsia Perchie' in particular. It's a lovely fuchsia pink shade but because of the fairly sheer and glossy consistency of these lipsticks, I find it perfect for day to day wear. It brightens up my complexion and I love how it leaves a stain behind when the gloss wears off. I still prefer the Rouge Edition Velvets but for daytime use, this has been a favourite this month. Now the sun is coming out (yay! ), it means my thick black tights, wooly jumpers ands roll necks will be put away until next A/W. This also means shorts and summer dresses will be making their way into my wardrobe so as much as I hate it, it's time to tan myself up. I do find the whole process of tanning very laborious but this Sienna bronzing mousse makes the task that bit easier as it spreads onto the skin so effortlessly and the colour it leaves is so natural and streak free. It's definitely my go-to false tan! Another thing I've mentioned in a favourites before are these eyelash curlers from The Vintage Cosmetics company. I've been using them for well over a year now and absolutely love them. I actually lost my old silver pair and hated not having them so I decided I'd treat myself to the rose gold version because you know, rose gold is the best! I can't say much about these other than if you need some good eyelash curlers that don't cost a fortune, these are the ones for you. They curl my lashes perfectly and the curl lasts all day. I can't fault them! Nip & Fab is fast becoming one of my favourite skincare brands and I imagine it will be one lots of people will be trying since Kylie Jenner became the face of the brand. I've been trying out the Dragon's Blood range of products and the stand out for me has been this Plumping Serum. I've been using it morning and night and have noticed a huge difference in my skins texture. One of the main ingredients in Hyluaronic acid which is known for being able to hold up to 1000 times its weigh in water, hence the 'plumping' effect you get from this product. I'd highly recommend it! Bronzer is one of my favourite makeup items and not a day goes by that I don't use it. I always add some definition to my cheekbones with a bronzer and Benefit Hoola has been my go to of late. I love that it's matte so it's great for contouring with and although it does have a slight orange tone, I don't mind it too much as I find it warms up my complexion nicely. I'm a huge fan of ghd's and have been using their straighteners for years now so I was very excited to try out the newest addition to their hair tools, the ghd curve, a range of curling wands and tongs. I have the 'Soft Curl' tong and I chose this one because I like big loose waves as apposed to tight curls. I must admit when I first used this I struggled and thought it was a bit of a faff to use. However, after a bit of practise, I've been loving the effect this gives my hair. If I wrap large pieces of hair around the tong I can create that lovely hollywood glamour effect which is what I was hoping for as that isn't easy to achieve with the straighteners. I'll be doing a full review of this with pictures of my hair soon! So there we have it, my most recent favourite products! I also wanted to quickly mention www.voucherbin.co.uk** which is a great discount website that offers discounts on various well known brands. 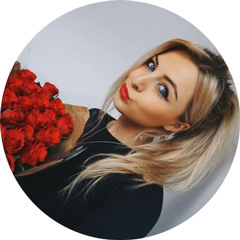 All you need to do is go to their Shopping Categories and select Health and Beauty to get exclusive discount codes for places like Look Fantastic, Feel Unique and HQ Hair. Well worth checking out if you fancy treating yourself to any of the products I've mentioned in this post. I am such a big fan of Hoola bronzer by Benefit. It is perfect for contouring. Looks like you've been loving some beautiful products this last month! I hope you've got your blogging mojo back and feel a little more inspired and motivated with it all! Great post! 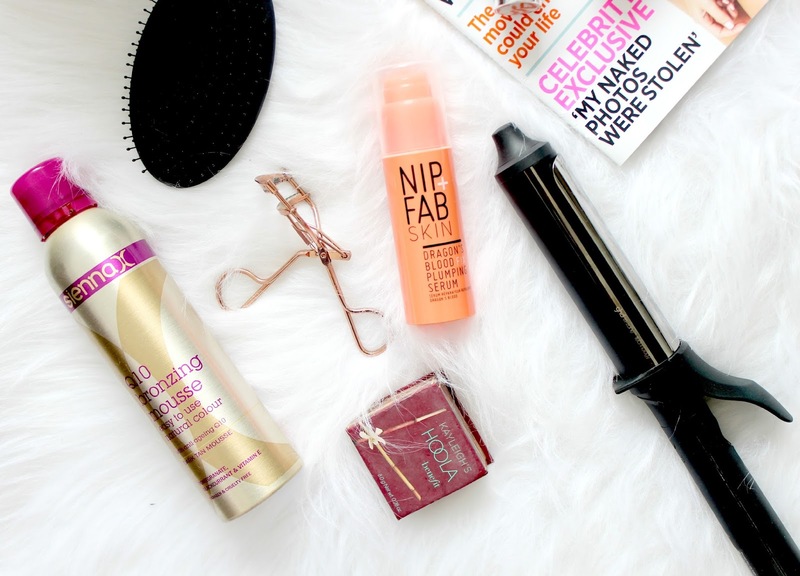 I love the Hoola bronzer and Nip & Fab at the moment! El hoola es perfecto..tengo y estoy amando! Hoola is just amazing, I don't think I could be without it now! The Wet Brush sounds amazing, I think I need to try it! I also took a week of from blogging it was hard but I had to get some rest and clear my head, I totally get that and think it's important to take breaks especially if you have a day job that drains you.. I have heard great things about the wet brush at the moment I'm using my tangle teezer.. I adore the tan, and its such a surprise as I don't normally get on with sprays! SO jealous of you having your own hoola! I need to try some of the new Bourjois lipsticks, they've got such mixed reviews! I was given the wet brush recently, it surprised me how much I liked it. I've not tried that type of kind to hair brush before and I thought it was a gimmick. What a great selection of favourites! I really would like to try the Wet Brush, but it's so difficult to get my hands on it here in Switzerland. Love the look of the wet brush may need to invest! 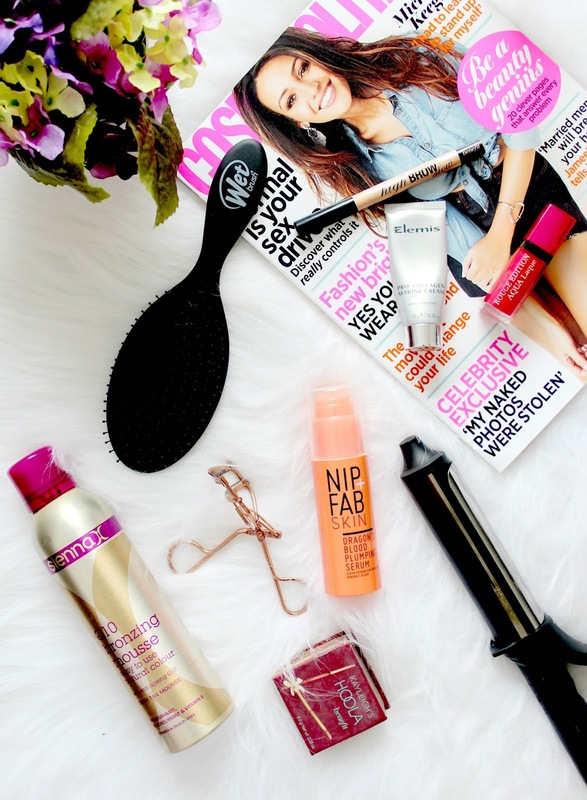 I need to try some Nip + Fab products! They all sound incredible. Great post! I need to try Bourjois Aqua. I am a huge fan of the Wet Brush! I actually have the big paddle version! It saved my hairs life! I'd never really looked at Nip+Fab before but you're right, now that Kylie is the face of the brand it has definitely got my attention! I'm always looking for serums that will hydrate and plump up my skin so I think this one will be added to the shopping list!